Stop Light Observations harness the spirit of the south, creating music that is elegant and brimming with energy. 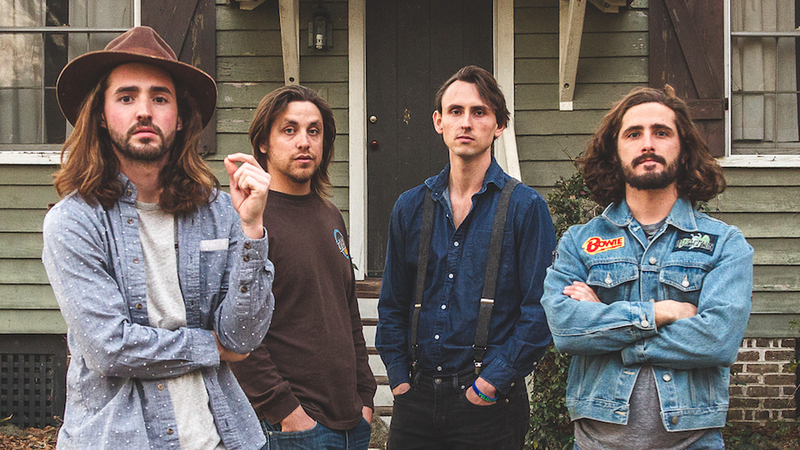 The Charleston-based band has been making rootsy alt-rock since 2013, when they released their debut record, Radiation. With hard-hitting melodies and anthemic songs, the “Dinosaur Bones” musicians took off quickly and amassed a cult following along the way. When Songwriter JohnKeith “Cubby” Culbreath was 16-year-old, he reached out to his classmate William Blackburn after experiencing a revelatory dream that inspired him to start up a band. It was fate, at least in their eyes. They began practicing, creating music, and then rounded out the lineup with Louis Duffie on guitar, Luke Withers on drums, and Will Mahoney on bass. Their recent achievements include breaking the record for most consecutive sold-out shows at The Music Farm in Charleston, and touring across the country playing festivals like Bonnaroo to Firefly. Next up for SLO? Following the release of their sophomore album, TOOGOODOO, the band is putting out an ongoing series of digital 45s entitled The Volume. Their direction, much like their union, seems destined for success. Blackburn let us in on the band's favorite tracks to listen to on the road, which include Kendrick, Ray Charles, and The Rolling Stones. Whether you need a song for a rocky morning or an easy-listening album for long drives, Stop Light Observations has you covered. Check it out below! "We’ve been listening to them since the beginning and Brittany continues to write and arrange beautiful music reminiscent of all the great Aretha and Blues rock music we grew up on. If you grow up in the church you learn to carry a tune and her melodies should be familiar." "Frank Ocean is at the top of his genre and seamlessly continues to inspire through uncommon arrangements and vibey melodies." "They are friends and a great local Charleston Band." "Kendrick gives us a glimpse into his frustrations politically and his motivation to continue to push the message passionately and honestly, He is, to us, the most important and influential musician in Hip Hop. The GOAT 🐐"
"You can put this record on and just let it play. The Stones keep the wheels on the bus going round and round for hours." "Mornings move slowly after a long night and this track is just right for those early morning blues. Modest Mouse is truly one of a kind." "Chance the rapper is one of the most important artist in music today and I feel like he will set the moral and creative standard for years to come. His message is one of compassion, love, and life’s constant push to be better and to embrace happiness even in the face of immense struggle. He is an innovator and inspiration." “They created a little sub genre that was refreshing follow up to artist like MGMT who really created this whole scene. This track keeps you moving no doubt." ""Kanye’s music is sonically above the norm and without a doubt a trend setter for not only hip hop artist but rock n roll too. Huge inspiration for us production wise. We also jam Runaway off of MBDTF, that album is his best." “These guys are just good people all around. We’ve had the pleasure of playing shows and talking life and love with these fellas. They are doing big things we are lucky to know and admire their art." "This song is my personal favorite of all time. I can honestly say if it weren’t for this song I may not be a singer. It is a masterpiece of timeless love and longing."